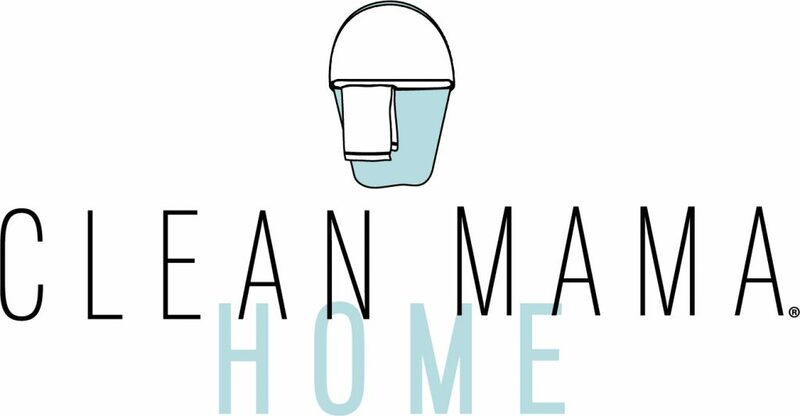 Want to get started making your own cleaners but not sure what you need? 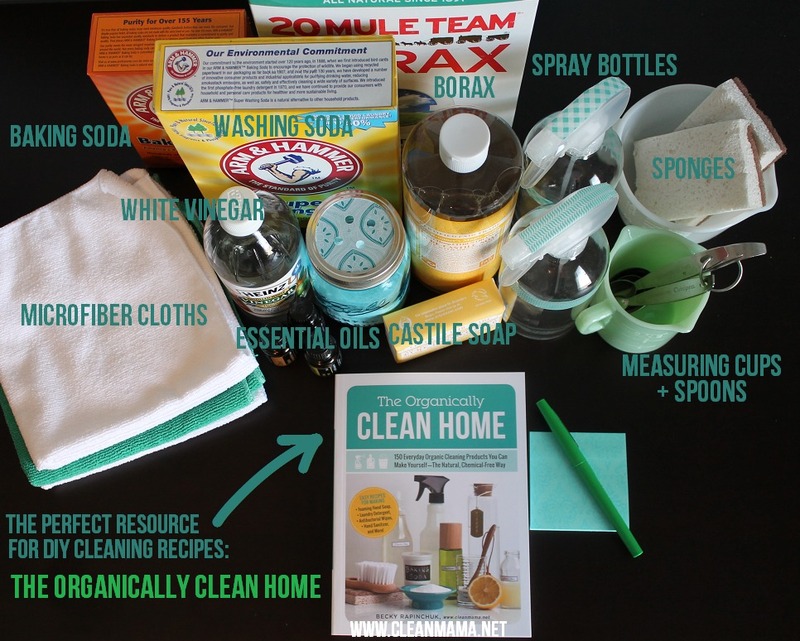 By taking a couple minutes to organize your supplies you’ll be ready to do a little cleaning anytime. Having your supplies organized and in one spot will help you save time and simplify your cleaning routine. If this is something you’ve already done, take a couple minutes this week to see if you need to add anything or if there’s something in your caddy that you aren’t using anymore. 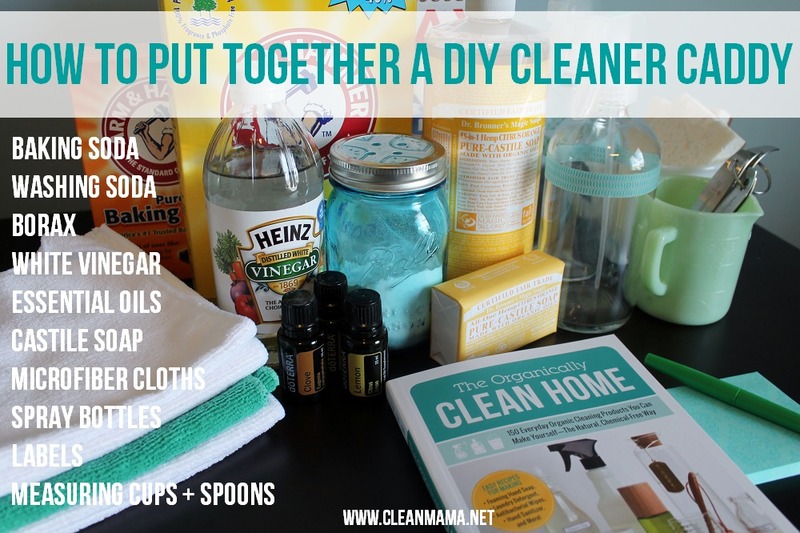 I’m going to show you how I put together my natural cleaning caddy today – in case you want to do the same – it makes it so much easier to DIY my own cleaning products if I have everything easily accessible. Start by gathering your supplies in a tote, bucket, basket, or container. (The one pictured is from Homegoods.) If your caddy is cute and functional there’s a better chance that you’ll use it, so choose something that fits your supplies and that you’ll enjoy using. Put the caddy in a place where it’s easy to grab and access anytime you need it. 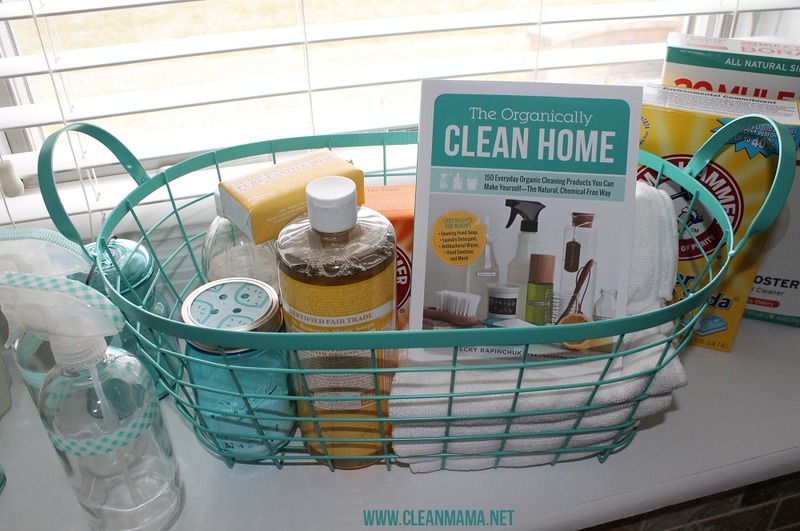 I like to keep this general cleaning caddy in the mudroom and smaller cleaning caddies in the bathrooms to use on Mondays when I clean all the bathrooms, when I’m supervising bath time, or when it’s convenient. This helps save time running around gathering supplies because I have everything I need at the ready – no wasting time. Messy bathroom? Reach for the supplies in the bathroom cabinet, clean up the mess and move on. If I had to go to grab a caddy downstairs I would most likely get sidetracked by something else and not get back to the messy bathroom. labels – use washi tape, labels, or any other method you like. For me, a cute label makes me a little more excited to clean. 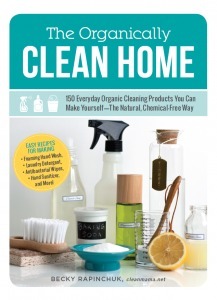 Have you ordered my book The Organically Clean Home? I live in Australia and I’m not familiar with the Washing Soda. Do you know of any other name it would be sold as and what is Washing Soda? I may be able to find an equivalent at IGA or Coles or Woolworths. Napisand is washing soda but buy the homebrand one. Exactly the same at a fraction of the price. Electric soda is another name for washing soda in Australia. Find it in the cleaning aisle. If you don’t mind me asking, where did you find your spray bottles? And are they glass or plastic? Thanks! Thanks Stephanie! The spray bottles are glass and from Amazon – I love them! Zany! Thanks for the link to buy the glass bottles. Stephanie, Hobby Lobby & Micheal’s carry washi tape. target also carries washi tape and some are always on clearance good luck! Hi Stephanie, Office Depot/Office Max in Houston also has washi tape. Hi Becky, these bottles are clear. If we are going to add essential oils is it important to use amber or is clear okay? Are the cleaning “recipes” in the book or somewhere on the blog? what’s in the ball jar? Where to buy the oils? 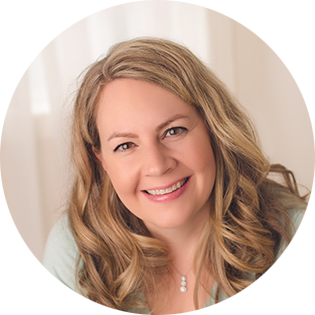 I buy my oils from doTERRA but you can also find them at your local health food store, on Amazon, and another favorite brand of mine is Beeyoutiful. You’ve mentioned before (and in your new book) using Vodka. What kind do you use? I don’t want to buy an expensive one for cleaning, unless it will make a huge difference. Suggestions? Also, where do you buy the castile soap? Use the cheapest version you can find 🙂 and castile soap can be found at Target (natural skin care section), your local health food store and Amazon – I have links on my sidebar. I just ordered your book! I have lots of allergies to most of the chemicals that are in commercial cleaners so getting something that is “natural” will be great! I ordered both the book and the citrus orange soap…. Can’t wait to get the book! 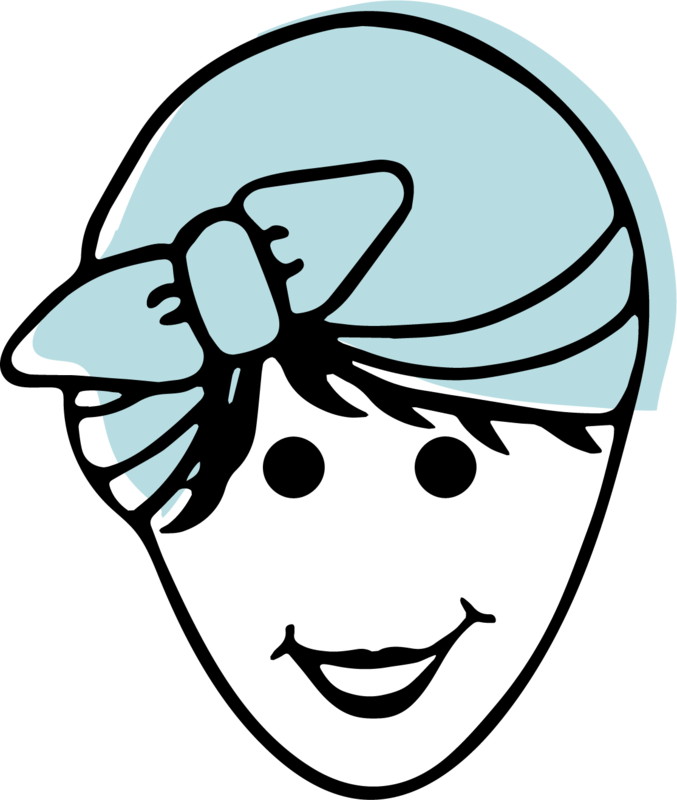 Cute… Cute… cute… I’ve been all over pinterest pinning various cleaning recipes and I’m so glad that I stumbled on you… because I think that I’ve concluded my pinterest search! Thank YOU! But, where oh where, did you get that delicious basket? I’m a little obsessed with all things aqua/turquoise this season… (another reason I love your site!). Thank you for sharing and all your hard work. Going to pick up the book! THanks Kimi! The basket is from Homegoods. Oh and I’ve picked up some plastic sprayers at Walmart in the ironing board isle for $1, then I just switch out the sprayer for a white vinegar glass bottle. The sprayer probably won’t last forever, but is significantly cheaper in the long run, even if they do have a bit of dark blue on them. 😉 My orange oil takes off the sticky residue from the vinegar label and even the date stamp on the bottle! I’ve been reading so many articles on cleaning your home and sanitizing it I’d love some of your recipes but they’re saying if you’re going to use essential oils that you need to use the dark colored amber bottles I found them for a dollar each plus $1 shipping which a good price. Borax is banned as sale to end users in Germany. Any ideas to substitutions? Question; Do you find that you like to use a metal or plastic caddy vs. materials? I am looking at a sturdy but cloth caddy that is on sale thinking of getting some but unsure if it would be silly? Thinking for the smaller condensed ones I would use elsewhere around the house.